Turkey’s state run Anadolu news agency reported on Saturday that 10 civilians have been given varying jails sentences of between 25 months and 9 years over alleged links to Gülen group, which the Turkish government accuses of masterminding a coup attempt in July 2016. 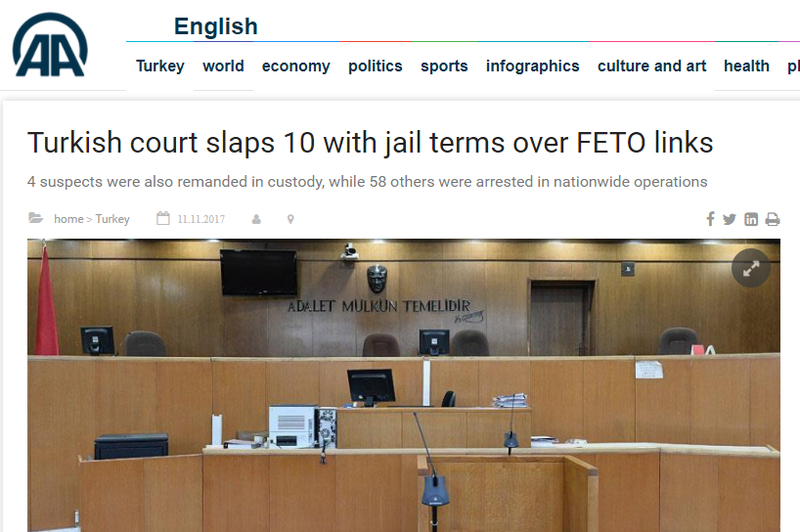 Turkey’s state-run Anadolu news agency reported the court ruling with a headline: “Turkish court slaps 10 with jail terms over FETO links,” in a clear reference to famed Ottoman slap, an offensive bare handed mele attack which was used by soldiers in the Ottoman Army. Turkey survived a military coup attempt on July 15, 2016 that killed over 240 people. The Justice and Development Party (AK Party) government along with Turkey’s President Recep Tayyip Erdoğan pinned the blame on the Gülen group despite the latter’s denials of involvement. More than 128,000 people have been detained over links to the group since last summer.